The tulips are wondering, “Is it ok to come out?” After the fourth-coldest April in Chicago records, the temperatures are finally starting to warm up. Huddled underground for months, the tulips are finally feeling the warmth. They are mustering up the courage to break out of their green shells. 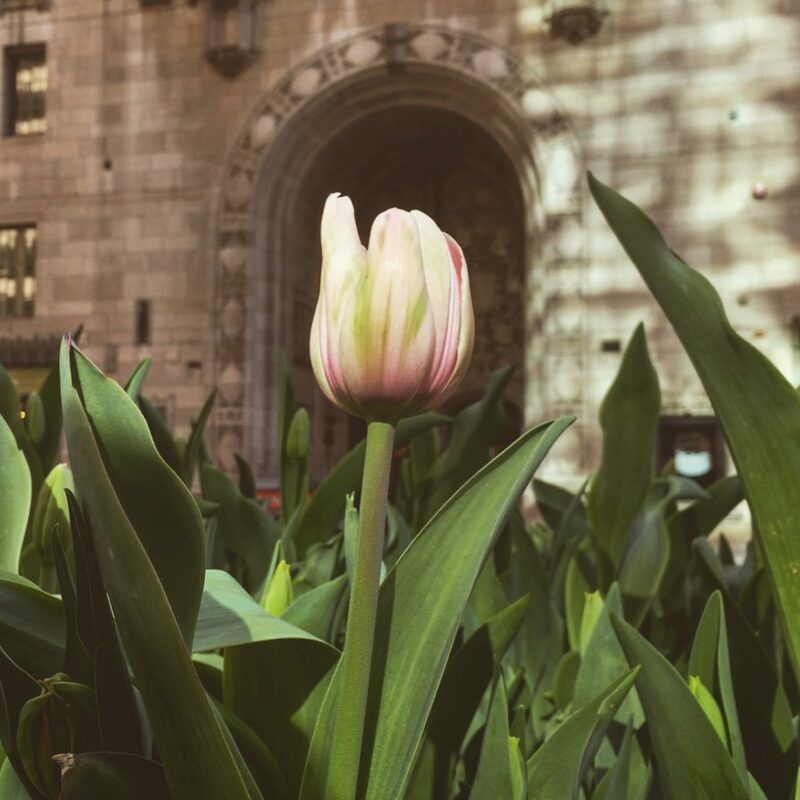 Seeing the tulips blooming is one of the great joys of working at the Tribune Tower. The wonderful garden medians in the middle of Michigan Avenue always have an array of seasonal plants. Every walk to work, to lunch, and to home; this wonderful garden is there. 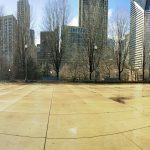 For 18 years I’ve enjoyed this urban garden in the middle of busy Michigan Avenue. Often I’ll walk in the middle of this expressway with cars buzzing by, just to get a closer look at what is in the garden. Why use the sidewalk when there is enough of a ledge to walk closely to the flowers and plants for a taste of nature in the midst of the urban city. Of the variety of plants they showcase in this garden, the tulips are one of my favorites. My annual tradition is to photograph the tulips breaking ground. Today while walking to work, there happened to be just one tulip blossoming. One pink tulip among a field of green plants, all awaiting to blossom. 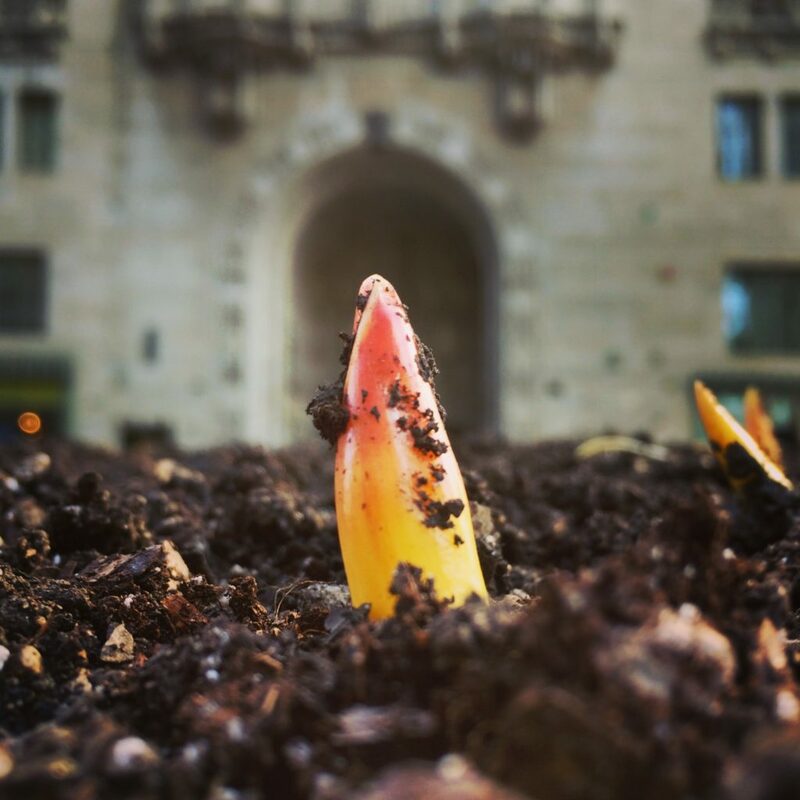 With this first tulip standing up, I photographed it with the Tribune Tower’s entrance in the background. The same backdrop I used earlier this year for the tulips breaking ground. Rather symbolic since the Chicago Tribune and my division, Tribune Content Agency, are leaving the historic Tribune Tower after 96 years. The same entrance that I walked in and out of every day will be the same entrance from which we all leave for one final time. Footnote: I wonder if this is the same flower in both photos. 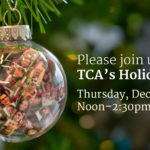 For now the plan is that we move out of the Tribune Tower in June this year.